So, after quite a bit of research, scouring the internet for seat solutions, and having to find a time where I could go without the bike for a decent period of time, I ended up deciding to take a gamble on a place in Indiana called ASTech Seats (http://www.astechseat.com/) based on some positive reviews I found on some cruiser forums around the web. The whole process took just under two weeks (I sent my seat off on the 18th of December, and I got it back on the 30th) purely because shipping was so slow. They called me as soon as they received the seat to verify what I wanted done, and within a couple hours, called me again to tell me it was done. So, I finally got the chance to take it for a nice long-ish spin on new years day. I went out for about 4 hours of solid riding in the morning, then a couple random half hour/hour and a half rides with friends throughout the rest of the day. With the stock seat, I was good until about the 2 hour mark, in which case it became an exercise in pain tolerance. 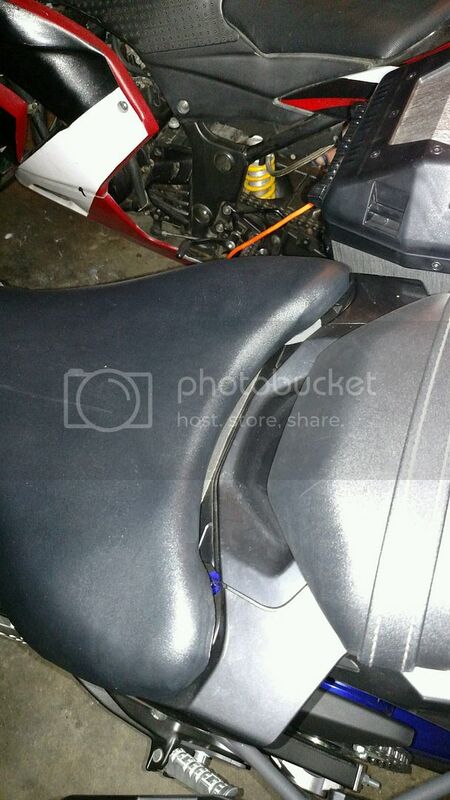 With this seat? Not an ounce of discomfort at any point in the entire day. SO. f@#%ing. STOKED! I couldn't believe it was as a big a difference as it was! I wasn't even walking funny after! The true test will be when I'm doing 500 mile days in my cross country trip, but I'm pretty satisfied with my purchase thus far. But, all in all, I'm so completely elated with the performance, that I have trouble being bothered by that. I may look into doing something to make sure it's still weather tight, although I doubt this is much less protected than the stock version, considering the fact that you pull up the back to mount or dismount the seat, which means it was never sealed in the rear. Be interested to hear what you paid for it. I would also be interested to hear from anyone that has the Seat Concepts seat (like I do) and has also experience with this company and can compare the two. And am I correct in assuming they reused the stock cover? That's what it looks like. yep, stock cover, stock pan, their internals. I like the look and feel of the stock seat cover as is, so that was actually a positive in my book. Love the look, but curious why a local classic/custom car upholstery shop couldnt have done it for you? I'm sure one of them could have. A friend of mine recommended someone who had redone their car a while back. But then when I looked at reviews, the car guys were all stoked with the shop's work, and the bike guys wished they had gone elsewhere. I may have been able to eventually find one that would have worked out, but it felt more like a "If you don't have time to do it right, when will you have time to do it over?" kind of dilemma, so I wanted someone with proven and specific knowledge of motorcycle seat comfort. Oh! Update on this! 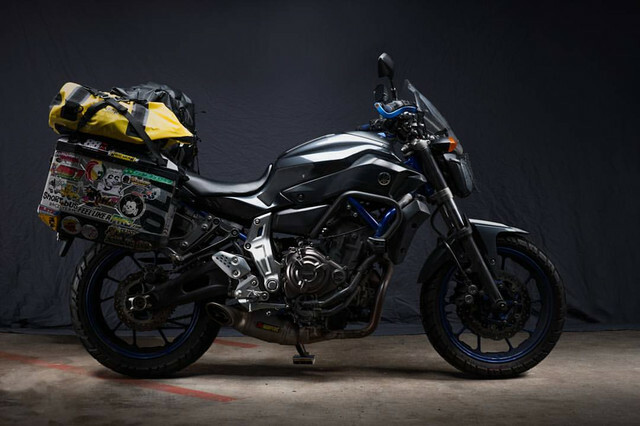 If you want a good test of a seat, I took my bike 9000 miles over the last month with days ranging from 200-550 miles per day, and the seat remained adequately comfortable the whole time. No issues walking after I got off, and no lingering soreness the next day. Taking a short <10 minute break every 1-2 hours or so for gas was more than enough to fully recover. Would highly, highly recommend this seat for sure. Not that other seats can't also be good, but this proved it's mettle for cross country and back, and I'll be keeping it for a full country tour. They did awesome work! Worth every single penny! Hey, would you still recommend Astech seats? Trying to decide between them and Seat Concepts. I've read that the combo of memory foam over gel is the way to go. Do you have any pics of your seat and do you know the name of the person who made it ? +1 on the pic. This seems like an interesting option. unfortunately this thread is a year old. 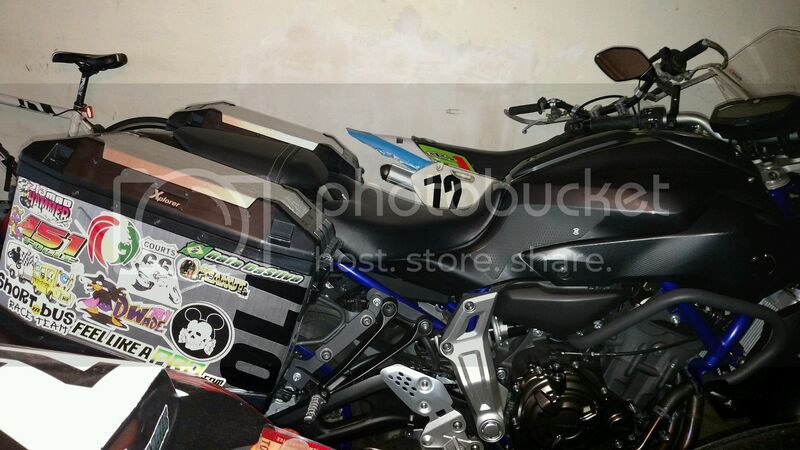 The photobucket picture links have been removed, but the manufacturer's link is still active on the first post. If your going to delete pic's why not the whole post. We didnt delete them, that image provider is blocked from this website due to security issues. HTTP links aren't secure and we focus on your security around here. I'm sure you would be much more pissed if we got members info leaked on hack sites like what happened to all of the motorycle . com forums last year. There is no "evil" moderator here deleting pics. I the admin am blocking http links because they aren't secure. To upload pics to the forum securely, just click that button that says "add image to post" and then click "browse from your computer" then choose your pic 's and then click upload. The software will auto dump the pic code into your post for you. You can delete the little advertisement link they put at the bottom. There is a right way to run a website (https secure) and a wrong way to run a website (http unsecure). We choose the secure route to protect our members. Everyone should listen to Edward Snowden more, and what he tried to warn us about. Sorry, didn't know this thread got bumped. I posted this a long time ago and didn't know the images no longer worked, and this forum never sends me email notifications for some reason, and being on the road long term means I'm not spending much time on forums anymore. 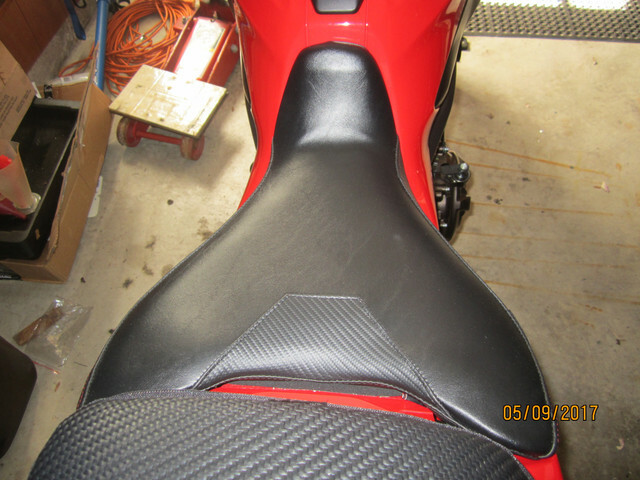 If you want pictures of the seat, there are about 10,000 of them in any of the articles I've written for motorcyclist magazine or on my facebook pages or instagram. It looks exactly the same as stock. Even the little gap I was initially unsure about is no longer there after a year and a half of use, so it's not super exciting to look at (the company does do custom stuff I think, though). Also, I've got just under 50,000 miles on my bike now with this seat, between doing 49 states of the US and now venturing through southern mexico toward Panama, and it's still great. No complaints here. Yep, still alive! (Although just barely after getting through most of Mexico- I'm in the state of Chiapas in a mountain town called San Cristobal right now. The roads are mostly great riding, but the third world title is not an exaggeration down here in terms of corruption and street maintenance, haha). Shooting for round the world (Or at least exploring the whole world, not necessarily in a proper rounded order), so it's gotten a lot more stressful! Also, im currently in your old stomping ground, staying in el segundo area. Got my seat done by Astech and It is much better than stock. 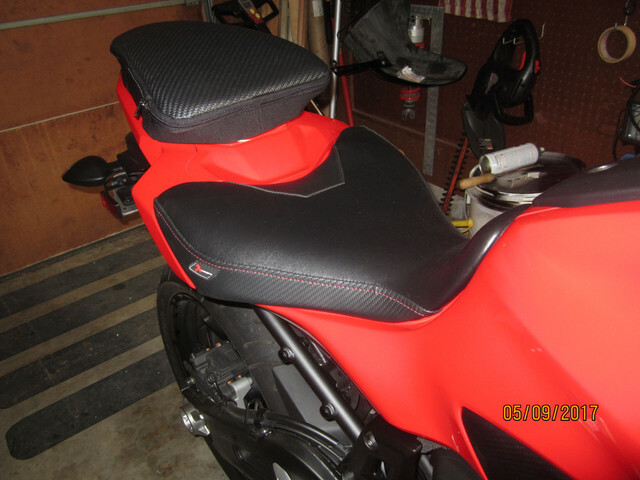 Only had some 60 mile rides so far butseems to get more comfortable the longer you set on it unlike the oem seat. My cover was torn so I hadit replaced with a luimoto cover. That's a collapsible tail bag on the rear seat. Sport bike guys I think. Cost was under $170.00 + my shipping to them. I have no doubts about that seats comfort and it looks like they did a good job. I did have a local upholstery shop that usually does boat seats do my seat with gel ($200 also) and it improved the seats comfort quite a bit. Did that shop use the gel that feels squishy/liquid like? Not all gels are created equal.